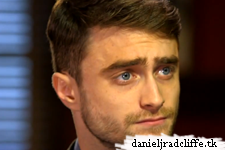 Daniel spoke to CBS This Morning's Jamie Wax about The Cripple of Inishmaan on Broadway as part of the "The Road to the Tonys" series. The Cripple of Inishmaan has been nominated for six Tony Awards. You already could view a short preview via this site's Facebook page, but here's the full interview. It's possible to vote for Daniel at the Tony Awards?